IndiBlogger Forum: Samsung Mobilers Winners : A Disappointment! TodayOnTech: Indiblogger and Samsung Galaxy Tab Contest – We call it a Scam! Firstly, we’re sorry this caused so much distress. We understand how much work goes into a quality blog post, and it’s tough when one’s efforts go unrewarded. This is not a winning entry, this is the correct link. When Samsung India sent us the list of winners, they had sent the correct link to the winning entry. We normally link to the IndiVine post from the winner’s list – and when we looked for entries by that particular blogger, we chose the wrong one. It was a human error, and it was corrected as soon as it was brought to our notice. The last tweet was also mentioned in this post, leading everyone to believe that we had awarded an entry which only had pictures to a launch event; this isn’t the case! It’s been suggested that we extended the closing date of the contest as there were not enough entries; that IndiBlogger was forced to do so because the promised number of entries was not met. The truth is, the contest was extended by two days because the Samsung Blogger Meet was re-scheduled for the 10th, and we wanted to give those who attended a chance to enter the contest after seeing the device and meeting the Samsung team. We checked all the winning entries for any sign of plagiarism before announcing the results. Considering that we burnt our fingers once before, we’re quite thorough for all our contests now. It’s been suggested that we neglected to disqualify this winning entry, because the technical specs were copied from here. We did so because technical specs are usually copied – either from the manufacturer’s website or another source, and copyscape/Google will always throw up several results for the same. It’s been claimed that friends of the IndiBlogger team and Samsung have been awarded the prizes. This is not the case – IndiBlogger had no part to play in the judging and Samsung India has nothing to gain by favoring friends – the entries were judged on the selection criteria alone (see below). It’s also been mentioned that winners have been randomly selected, a misconception because we stated on the contest page that the winners are displayed in random order. As was stated on the contest page: Entries will be judged based on creativity, relevance, depth, impact and level of interaction. Judges, in all their wisdom, are only human. Everyone has their own way of looking at things – and what is important to one, may be considered irrelevant to another. We are not aware of the weightage given to each of the criteria above – that decision belongs to the sponsors of the contest, as it should be. Some entries may have been found to be so creative that it caught the judge’s fancy, and it may have outweighed the other factors. Some entries might have been so well researched and insightful that it outweighed the need to be creative. That is why the winners are a mix of techies, fictional writers and comedians. We believe that if the judges disregarded the entries and only chose bloggers who would make good Samsung Mobilers, they would have chosen only tech bloggers (considering they tend to have better reach). In the end, 20 winners needed to be chosen out of 220, and we’re certain that Samsung India gave the judging process the time it deserved. To say that their judgement was flawed by criticizing the winning entries and the work those bloggers put into it is extreme. When we launched the contest, we had stipulated that only those who promoted the live webcast would be allowed to enter the contest. Unfortunately, this was a bit botched up – this announcement was made on the blogger meet page, and it led to a lot of confusion. Some bloggers said that the webcast was showing up as a blank screen; others thought that they had to attend the blogger meet in order to participate in the contest; some thought that the launch event and the blogger meet was the same; and a few were misled into thinking that the launch was postponed along with the blogger meet. We also had many new registrations during those two weeks, as bloggers were signing up with IndiBlogger purely for the contest. Our moderators had a tough time keeping up, and several bloggers were approved only after the launch event. It was to accommodate for all of this, we had to simplify the rules; and we allowed bloggers to link to the recorded version of the webcast within their entries. We realize that those who abided by the original rules and went all out to promote the live webcast on their blogs, twitter and facebook feel slighted by this change. We do apologize – it was a decision that wasn’t made lightly, and on hindsight, may have been the wrong one. On the other hand, we feel that the change increased the level of competition, and that’s always a good thing! The person in question is a former IndiPolice of the IndiBlogger forum, which is moderated by the community. Members of our team (part time, full time and one-time) are listed here. Unfortunately, he left the IndiBlogger community a while ago, as he did not like the way we handled the plagiarism problem, and wasn’t happy with the way the forum was run. We’re still sorry he left; he brought to light several issues on the forum (carefully disguised affiliate links, for instance) which the rest of us had not realized. His advice to us before he left has proven to be invaluable, and we hope to see him back one day, assuming time really does heal. However, to use the words “staff”, “confesses”, “scam”, “inside story” and “dirty truth” is a tad misleading, to say the least. We’d be happy to update this post with any questions we’ve neglected to answer. If we have missed out on anything, it’s not intentional; it’s just been a long day and an even longer week. We didn’t mean for all of this to happen, and we certainly didn’t anticipate it. I (Renie Ravin) must admit, I’m not too pleased about confidential emails and personal facebook comments shared out of context, let alone being shared at all. IndiBlogger and what it represents is much more than work for all us; we live for it and we do it 24/7 (much to the dismay of friends and family.) We know this doesn’t necessarily make us right – we’re here to learn from mistakes and make changes, as we’ve done several times before. We do hope that all of you who feel disappointed right now would stick with us while we do so. Star Movies, Indiana Jones and blogging! when i saw the winners list i was not there,i was sad for a while but then not all can be selected in a contest,those deserves can only be selected and i got along with it. Havn’t participated in it. But like to say Samsung gets everything in the end (what he was palnning) – s successful launch. Since it is a contest so, not everyone wins. Thank you SO much for this post! This really clarifies all the doubts, questions & criticism everyone was talking about. Yash, what did you want to clarify and what do you see clarified here? Just because you win, you would go gaga and fall under Samsung’s /Indiblogger’s hands and support to whatever they say.. even if they had said that there were a few non-deserving winners but we won’t change the winners list. Just because, you won the contest. My comment was for Renie to reply to, not anyone else. And, I would have had the SAME views even if I hadn’t won the contest, Mr. Chetan. Plus, I really don’t think thanking someone is going ‘gaga’. Sour Grapes, Sour Grapes! Shame-shame! The winner is trying to be impartial and y’all don’t even give him a chance. Reeks of insecurity on, umm, your part, don’t you think? I/my bhaiyya lost, so let’s defame the winner. And indiblogger, of course. We have no proof but we still go ahead and virtually headbutt Indiblogger’s founder. Wow! What beautiful logic! Yash won, and you, or even Indiblogger, can’t change that. So let’s move on to grumbling about something else, all you testosterone-pumped individuals with too less intellect to even understand how candidly the founder of Indiblogger has clarified himself? Thank you. I doubt it dude, I seriously doubt it. Insecure? Seriously? U’re turning a contest into a personal war, Mr. Narang? I don’t want to start any war. Sorry, for the disturbance caused. As expected, a non-convincing post. And as expected, Indiblogger says it is Samsung’s decision and not Indibloggers’ team decision of selecting the winners. But when the platform of running the contest is Indiblogger, why start the blame game? Let me ask you, can you AGAIN define each word of it? Because, in the posts that won, a few had nothing of what was wanted.. no interaction, no impact, depth and creativity! Yet, they won the contest. I updated my post at http://todayontech.com/indiblogger-samsung-galaxy-tab-contest-scam/ with a screenshot of the winning post, and you may check how beautifully and creatively it is written to win the contest. WOW! Just WOW! I am not against the blogger, as I said he is just lucky to have been selected as a winner.. and I don’t want Indiblogger to play a 3rd person to sit and make us both fight with each other. And in my case, a few people asked me that my brother Amit at androidadvices.com won the contest, then why am I complaining? I run my own company and he runs his own.. he has a well deserving post so I didn’t mention about it. If his entry was a bad one, I wouldn’t have been partial. I am fighting and arguing because I want to ask why my entry didn’t see itself in the top 20, when it had most of the criteria at its best.. i.e. the level of interaction, relevance and depth. Let me see some wise answer from Indiblogger, or the great sponsor Samsung here.. because what I read from the big post here is that “You Bloggers were just used, so shut up and move on.. cheating is nothing new with us, you just need to learn that”! You planned the reply, spend two big days replying it and we guessed this reply three days back. Anyway, it was a good experience being in Indiblogger and participating contests unless we were shown the truth by some bloggers. My comment is pending. Hope that comes out approved unedited. Hey Chetan, the comments are moderated to keep out spam and anonymous trolls. I guess this is the first time you’re posting a comment on our blog – all future comments will show up immediately! I had posted a long comment which isn’t approved yet. It had a few links, so do check if it ended up in the spam zone. BTW, I forgot to mention that we are not silly that we will get mixed up with the words random order and randomly selected. I know that I may not be that much good in English but I really know the difference between randomly selected and list show in random order. Puneet ji, let me inform you that there are two guys behind Tech2Date, one is Sathish and the other one is me. So whenever I’m writing ‘WE’ I’m writing on behalf of us both and it doesn’t mean entire tech-bloggers community. Hope I’m clear now. If you have got some more questions then please mail me or msg them on Facebook. I’ll reply you whenever I’m free. “When Samsung India sent us the list of winners, they had sent the correct link to the winning entry. We normally link to the IndiVine post from the winner’s list – and when we looked for entries by that particular blogger, we chose the wrong one. It was a human error, and it was corrected as soon as it was brought to our notice”—— We do not the truth and you could always say it was a human error. “The truth is, the contest was extended by two days because the Samsung Blogger Meet was re-scheduled for the 10th, and we wanted to give those who attended a chance to enter the contest after seeing the device and meeting the Samsung team.”—— So you were trying to give undue advantage to those who have participated in your sponsored meet. If it contestants were given undue advantage how could that be a competition. @Plagiarism: I do not know about this, but mine is one of the first post in this contest and it was open for full public view much before the contest close date. I always wondered how many would copy my approach. @Favoritism by the judges/random selection: What can I say about this? I always believed that a competition as small as this wouldn’t have favoritism. Well, if it was, pity them! 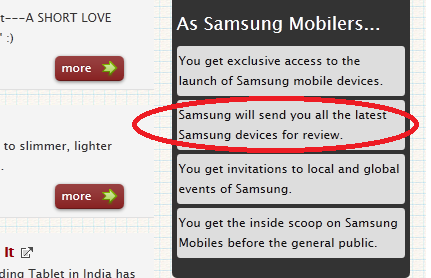 @The selection criteria: It was Samsung’s choice (as per Indiblogger). Their contest, their winners. “Unfortunately, he left the IndiBlogger community a while ago, as he did not like the way we handled the plagiarism problem, and wasn’t happy with the way the forum was run. We’re still sorry he left; he brought to light several issues on the forum (carefully disguised affiliate links, for instance) which the rest of us had not realized. His advice to us before he left has proven to be invaluable, and we hope to see him back one day, assuming time really does heal.” ——- Well, if his advices were insightful you could have changed. Overall, this looks like a complete PR stunt to just divert attention. If you were so sincere, you wouldn’t have let this happen in first place (by your own confession you admit that you have made lots of mistakes in the past as in “we burnt our fingers once before with plagiarism” and “Former IndiBlogger staff “confessing” the truth” ). I also believe that Indiblogger would accept my comment to just prove that they are sincere and create a positive impact on newbies that they are sincere. Firstly, I’d like to congratulate all winners. I envy you, honestly! I’m just sad that my entry bit.ly/GalaxyTab750 did not win and I have my reasons. I was really hoping to win because I thought my entry was different. It didn’t just go on and on about the specs. It actually was about the Tab’s features that I liked, features that make the Samsung device stand up and take notice among many other tablets with relatively similar (if not better) specs and that was in fact the theme of the contest. Not winning doesn’t hurt as much as losing out to really bad posts does. Honestly, I didn’t like most of the winning entries. They were just specs converted to prose. All they had was long paras with specs highlighted in bold. I understand IndiBlogger doesn’t interfere with the judging process, so no hard feelings for them but I think Samsung India have made a big blunder. You have selected posts that rant about the 1GHz proc, the 7000mAh battery etc. Don’t you realize these specs will be ancient in a couple of weeks! Plus there are several sites that list mobile specs in a easily searchable format. I had read most of the entries to this contest and I feel there were a lot of entries that were definitely better. But then it’s just a matter of personal choice and as the post says, everyone has their own way of looking at things – and what is important to one, may be considered irrelevant to another. Having said all that, I also believe that a few good entries are getting sidelined because of a majority of bad ones. I really liked entries from tripwip, sidoscope, techquark and even Gingerchai. These really stood out for me. Special congrats to them. My entry was also finely lined with the criteria on which the winners would be chosen. I tried my best. I like your blog bro, it’s neat. I was reading all the posts in the forum and keeping track of controversies ! Here is my take on it ! “Be Calm”, it’s just a contest, not saying bcos I won it ( Surprisingly 😛 ), but bcos you just can’t come up after the results saying I didn’t win, my post was better than others and the list goes on. It’s a judges perspective, and unfortunately you are not the judge ! “One man’s food is another man’s poison”. I hate Gazals, but others love it ! Simple ! Talking about promotion, using Indibloggers, and PR activities, YES THAT IS TRUE and what’s wrong ? It’s called social marketing, were you not aware that your blog will aid Samsung to market their product ? Samsung is not a non profit company and holding such contests for promotion of product is not wrong “in my opinion”. In the end, Indiblogger is an awesome community. Trust me ! Keep Blogging :: Keep Rocking ! A very expected reply from your side. No offense but – When you show us a ‘correct link’, what good you see in it? Can you compare it with the other stand-out articles that happened to be a part of your contest? Even if you wash your hands saying that it was elected by the Samsung team, don’t you have any role in keeping things fair?? Oh well – What for.. You might have received another set of Tabs for your team. This isn’t really cool Renie. Your team gotta do better. P.S This comment is not made upon my disappointment of failing the contest. But in regards to the efforts taken by real-good-bloggers to win this. Just so that we’re clear, Indipolice is NOT a staff, we’re volunteers. The reason I taken over the Indipolice so that people can stop annoying me and other people with selfish promotion and all that spam. And you guys are doing a really good job at it. Keep up the good work! I understand that Indiblogger wasn’t a part of the Jury but why not. We are bloggers not some brand’s publicity minions. We write because we want to write and not on some brand’s orders. I feel you guys at Indiblogger should fix the criteria on which the winners would be selected, then rate each entry on a scale of 1 to 10 in those areas and then display the excel sheet once you announce the winners such that it is transparent. If you guys are going to give the decision to Samsung, they are only going to choose the winners who benefited them the most even if his/her article wasn’t as good as somebody else’s in those areas. I am truly shocked to see that Indiblogger has given the right of selection of winners of brands. Rakesh, I don’t see any relationship between what you did and what you are claiming. You said “We are bloggers not some brand’s publicity minions.” Firstly, you do not represent the entire blogger community do not use “We”. Secondly, where were these ethics gone where you wrote an article to enter into the contest. All those who are claiming that indiblogger and Samsung India cheated them, first try to understand that none of the two companies forced you to write an article on your respective blogs. It was you who decided to enter the contest. You are just a participant and judgement is left to others. You can’t say judgement is wrong because the things didn’t go your way. Those who are claiming that this is a scam, just think for a few moments that isn’t it would have been more beneficial for Samsung India to choose all the tech bloggers as winners because ultimately those are the people who write most about them. But the fact of the matter remains, that Samsung India did not do it. Winners include tech bloggers and non-tech bloggers also. Accusing Samsung India of not being fair, in my point of view, is not fair. I don’t have any ill-feelings towards any blogger, but the way people are raising the issue is something which I don’t appreciate. There are many false claims which you guys are trying to put forward. One of the bloggers have put two screenshots of tweets which were result of wrong link being put by indiblogger which they later correct. After I pointed twice or thrice that he is misleading his readers, he removed one of the screenshots, one of them is still there. I have no issues with you people taking up the issue, but atleast present the facts correctly and don’t try to modify them to meet your motives. PS : I know some of the people now start commenting that because I am a winner I am supporting indiblogger and Samsung India. Those who thinks so, I pity you guys. I can’t help it. I say what I do and I do what I say. It is your immature brain that is unable to find the connection. I don’t want to start a Blogger fight here on Indiblogger.in so go enjoy your tab and mind your own business. This is my last comment on this post. You just got lucky. Enjoy your tab that you didn’t deserve. Make sure you take charge and select the winners on the basis of criteria mentioned. So you are here to abuse. Well no issues you can do that. That shows your frustration. Don’t say “I say what I do and I do what I say” You said you are not “brand publicity minions” but to take part in the contest you did that. Nothing more to say. Puneet, Why are you trying to defend or answer on behalf of Indiblogger? I believe that you deserve to win the Competition and you should have ignored our comments, but you’ve entered. So, I just wanted to say you a small thing, and hope you don’t take it personally and it might not disturb our relationship as well. As per few people who are commenting over here and supporting Indiblogger are saying that, unless they trust Indiblogger and support them or without knowing its a publicity stunt why they have participated and complaining after result. The Reason is, we thought Indiblogger is clean surface and responsible community. Secondly its Android Tab and we Techies always dream to have our hands on latest Gadgets. Next Reason and most important thing is Opportunity to become Official Samsung Mobiler which is such a proud thing. These are the 3 elements which made us to participate in the contest. I don’t say all the winners in the list are undeserving, but yea most of them are undeserving. Unfortunately your post was not linked correctly which might have made you feel little unhappy with our behaviors. Nextly, just go through the Winners articles and compare them. I’ve personally test Galaxy tab 10.1 with iPad 2 as well and written over 2500 word article which took over 2 days for me and I’ve skipped 2 small projects for it as I’ve taken it really seriously and I’ve planned every thing to Win it. I’ve even spent 2 more days on Promoting and totally over 1 week of my valuable time has gone wasted for such a silly thing. We all Bloggers are not worried about the fact that you’ve won a Galaxy Tab and we haven’t, but despite of fact that the time spent and quality review written, the effort kept are the things that are making us really unhappy. If we’d know that results are going to be thing sort, then we’d never have participated and Please don’t blame 1 or 2 bloggers. They are trying to carry the voice of all bloggers. The revolution was only from bloggers who definitely thought that they are going to win and going to be official Samsung Mobilers. They certainly know that they deserve to win and please don’t cross mark this. Yea 5-8 deserved entries were not selected. If you think only few fellow bloggers are complaining. Yea that’s true. The list is small because only bloggers who are worried about the work and time theft that was happened for them are complaining. And few people over here who are cursing us, don’t have damn right to talk or involve in this issue. I just ask him/her to leave the conversation respectfully, unless they belong to some Indiblogger sources. Hope you Got my point and congrats for your galaxy tab and official mobiler. You deserve it, but most of the people doesn’t. Hey Siddartha, firstly thanks a lot for putting forward your views in such a simple manner with no hatred. I have already said enough, but I guess you misunderstood me. Buddy, I never said that you or anybody who did not win didn’t deserve to win it. Infact a few people complained that my entry is not worth winning, but I never retaliated with them. It’s their view and not everybody thinks the same way. Some might think this one is good others might think anyother is better and that happens. You shouldn’t forget that you created this community for INDIAN BLOGGERS and not a place where every other company’s could dump their marketing tactics. Yes, I agree with Rakesh. Indiblogger should have been involved in the jury as Samsung would undoubtedly choose those bloggers who’ve gone nuts over the brilliance of Galaxy Tab. The reply is a carefully worded and considered one which is on expected lines. They kept postponing a reply as they were wishing that the outroar from the cheated contestants will die down in a couple of days, but it has only gotten bigger! If I may draw an analogy here of what is currently happening in our national politics too. The PM, Man-Maun Singh, kept on defending Raja till the evidence became too glaring for him to duck under a veil of silence any more. He now says Chidambaram enjoys his full confidence too. As things are unfolding, we won’t be surprised if it was MMS himself who instructed Chiddu to approve the 2G deal. And no points for guessing who instructed MMS! No wrong doer in our country accepts that he/she has done wrong, till s/he is forced to do so and is left with no other alternative. Let’s admit it, we are a corrupt country. A former staffer of Indiblogger.in, Rohan, has himself implicated them. No matter what they say to defend their decision of changing the rules suddenly in the middle of the contest. Here is the REAL REASON : They changed their rules half way through the contest BECAUSE there were only 80 entries which had complied with the original rules! And it would have been very difficult for them TO CHEAT and choose their own people from among these 80 entries! Their act of nepotism would have been too glaring if they had chosen their own favored people out of just 80 entries. It is much easier to cheat from a larger pool of entries (221 in the end). With 221 entries, they can easily justify their poor/partisan judgment by saying that not everybody can win from the 221 entries! This was their plan! Since you now accept that the decision to change the rules mid-way was a wrong one, what do you propose to compensate those contestants who were adversely affected by this arbitrary decision? I wish there was a like button here. Let the winners of this contest applaud each other here, we’ll watch in amusement. Perhaps they have got an ultimatum from Indiblogger.in (Renie) that if they don’t get vocal to support them on this thread, they will not get their prize! So nobody can stop them from trying to defend their “prize”. Also, pls note that not ALL of the winners are undeserving! Nobody has said that. But at least half of them are undeserving & beneficiaries of undue nepotism. Some of the winners may have been chosen just because of their “loyalty” towards Indiblogger.in, as in they may have been writing here for a long time. So perhaps, the owners of Indiblogger deemed it fit to reward them with a “prize” for this! This contest is over and done with. Now let’s move on. No matter how Samsung & Indiblogger decide to compensate those who were adversely affected by the arbitrary changing of rules mid-way through the contest, one thing has become very clear (at least, for me). That the bloggers coming to Indiblogger.in should not be fooled ever again into partcipating in these cleverly designed marketing stunts called “contests”. Here are the key take aways from this whole Samsung Mobilers Contest fiasco : Indiblogger.in & their Adverstisers like Samsung are only using you…. 1. They are using your writing skills to publicize their products FOR FREE! Good writers are not easily available and command a high price……here, they get them FOR FREE. 2. They are also USING YOUR PRECIOUS WEB-SPACE FOR FREE for prolonged periods. The duration of most contests on Indiblogger.in run into MONTHS! SO NEVER AGAIN! What do you want from indiblogger team? Should they announce you as one of the winners? Or you are looking for something else. In one of the comments above you referred that indiblogger used your “Precious” Webspace and writing skills for free. Did anybody from indiblogger team forced you to write a blogpost? Did anybody from indiblogger team forced you to give indiblogger free publicity? You said indiblogger should share ad revenue with bloggers. Well I agree with you on this but a bit differently. They should share only if they are hiring you to do the work for them. Were you hired by them to write the post about Samsung? In one of you comments you referred “lack of ethics”. Do you think lack of ethics was just on part of indiblogger? You did not wrong, huh? Blogging Ethics require that Bloggers should not cheat there readers, so were did you cheat your so called “lakhs of visitors” by going gaga over the Tab. Ask yourself before answering. I updated my post at todayontech.com/indiblogger-samsung-galaxy-tab-contest-scam/ with a screenshot of the winning post, and you may check how beautifully and creatively it is written to win the contest. WOW! Just WOW! I am not against the blogger, as I said he is just lucky to have been selected as a winner.. and I don’t want Indiblogger to play a 3rd person to sit and make us both fight with each other. I don’t know why a duplicate thread has been started on this blog by Renie, when all the original discussion took place in the forum. All posts about this subject should be in the Forum thread not here. I don’t have the time for posting duplicate messages. Hey busy man, how did you get time to copy one of your threads then? Many are having issues with the winners. Lemme focus some light on this. Who are you to judge the contest and criticize the winners? You are just the participants and your role ends there. You might have been a tech blogger with decent traffic and followers, but does that grant your stand as a winner? You must know that Samsung might be following some other aspects while choosing the winners. Many are not happy with the way few non-professional & personal bloggers were announced as the winners. This clearly indicates that Samsung just wanted to award the tabs to 20 people who have the ability to impress them with their articles, does not matter if he is a techie or non-techie. Thanks Samsung for allowing the whole blogging community, not only the tech section, to participate & win. And WE WANT JUST THE CORRECT ANSWER OF WHY EACH OF THE ENTRIES WERE SELECTED AS THE WINNERS. NOTHING ELSE. COMPARE THIS WITH A LIST OF 20 ENTRIES WHICH WE FEEL HAVE BETTER STRENGTH TO WIN, THAN FEW OF THOSE WINNERS. CAN THIS HAPPEN? LETS SEE!! Did you read the winning entries? Correct me if I am wrong, but the people who have problem with this are all “tech” bloggers IINM? I don’t think the contest is limited to tech bloggers- or any type of bloggers to begin with. Where does the name Tech Bloggers come here from? Did we mention about that? We are talking about the rules that you guys laid in the contest. And yes, I read not only those non-deserving winning entries but almost 70 other entries too.. which you moderators and contest sponsors might have not read because you guys just planned some stuff, so there was no need for you people to read anything there. I want the answer for my question. Would you be able to stand by your judgement and explain why each of the winning entry was selected, and the others not? Chetan, just a clarification. Moderators are no where related to IndiBlogger administration. They are just members like me and you with an additional privilege of to be able to delete any thread which are non-related to the forum. They don’t and can’t have any role in determining rules and winners of any contest or for that matter any administrative decision. The above comment was removed when it was found to be anonymous! I don’t see non-tech bloggers crying about it. Tech Bloggers. The guy from Tech Junoon, is trying to show as if he is representing the entire tech bloggers community. Just Read the title of his blogpost. The guys who are not happy with the results can be counted on fingers. Then they shall now officially be called as “tech” bloggers. Leave Indiblogger if it piqued your ego so much. Burn the homes of the poor techies who won. They will not. There is a good reason for it. Then get them to stop blaming those who won. Or Indiblogger, for the matter. They just hosted the contest. They’re not doing this for the prize. Who cares about 1 tablet when the contest is more than that. The clue is there. Its only the “tech” bloggers who are cribbing about it. Its about not the tablet or a contest acknowledgement. It never was. Its about getting a media contact to get media samples for review purposes. One of the wins did say that the winners will get access for review samples. They will come in hordes. Why wouldn’t they? Many tech bloggers plead in getting media samples by sending mails on a regular basis- also say “if you give us this to review, we will write good things about you”. That’s why how I hate how tech blogging is done in India. Most of them are idiots. That should also explain the claims tech bloggers make. These people can a thing or 2 from techie-buzz and that labnol guy. Rest of my views were on Indiblogger from the start as soon as the contest started. I mean, look at other articles from the blog links above- the “reviews”. All they do is gather random shots from multiple forums/product shots and convert basic specifications into an 100 word essay and jibberish Conclusion. Its obvious, every computing hardware can be benchmarked and all reviews usually should have benchmarks so that the people how good/bad a hardware is. Tablets, mobile phones pretty much is the same but stress testing is different from desktop/notebook computing. That’s why I don’t do “Gadget” reviews. Most of the gadget reviewers are basically….numbnuts. 50 bucks says now they are going to troll on me. If they don’t troll on me then they’re bit smart. @ Puneet: Nah. Well- it could be one of the reasons. I posted a lengthy post above you with 2 links (1 is an image and second is to indiblogger’s thread) but that’s currently “awaiting moderation”. If that kind of blogging is not your cup of tea, Sorcerer, let them be. I don’t like blogging about gadgets, either. Either way, we have to agree that this is a hot case of the Sour Grapes Syndrome. We are not fighting against Indiblogger or Winners. We are fighting against the ruling out of out work! We love our work and we respect it a lot and we are not even doing it for Galaxy Tab or anything else. We are the Guys (team of guys who oppose the entire contest) who are Full time bloggers, Part-time bloggers, Founders of Companies and also we’ve left jobs from MNCs to enter into blogging and we are serious about it. Yes, the seriousness towards the work pays us. The reason for us to blame Indiblogger is nothing, but its simple logic. Unless they sponsor the contest we’d have not participated and wasted our valuable time. Time is the major factor we are talking. We have not only participated for galaxy tab but also for Official Samsung Mobiler opportunity and we believe that we deserve it. It’s regardless for us, who have involved in evaluation. Indiblogger must have also referred the entries before publishing the winners list. I must tell you the fact that more than 3 blogs haven’t followed the rules that which made us to piss-off. Of course again you may say its our problem and yea since its our problem we are fighting. And who are hell you to blame us or to question us? Are you working in Indiblogger or the winner of the contest or did u even participated in the contest? You don’t have damn right to ask? Why are you backing Indiblogger? We just want to let these guys listen to our voice and also, don’t you think that Samsung Guys doesn’t listen to Indiblogger team? Unless they listen, how can they make a deal? So, its the fact that Indiblogger is least bothered about the contest and so was the Samsung, just picked winners Randomly. Although they have changed rules in the Middle of the contest. We’ve obeyed them and we kept on updating ourselves. Few of the bloggers worked really hard and just feel the power of blogging and just enter into the world of blogging, you’ll definitely understand our feelings. Just don’t write about flowers or general things. Just try to write about the new things and you’ll definitely feel the soul of blogging. And please don’t back-up Indibloggers as well as Winners and please don’t call them as deserving. It just hurts. Sorry If I’m harsh towards you. I don’t know you personally, but was really upset with your comments. So, just thought to make you aware of our feelings. lol why would most of the bloggers care about Indiblogger? Its a site and we bloggers are on it. People need to stop growing that “India TV” mentality that just because someone1 is not agreeing to what you’re saying and/or going against what you’re necessarily means they’re supporting Indiblogger. If Indiblogger did something wrong people will obviously point out. You’re obviously not on the forums so you should stop assuming things. Have you heard of the word neutral? Deserving/non-deserving. Who are we to say? They won. They were chosen as winners. Its as simple as that! Do you see how this works? Sure, maybe couple of those winner posts are lame in reality but Samsung chose them. Its no different from you when you choose something ridiculous but you liked it and others hate it to death. I don’t understand why “pro” bloggers use the usual cliche “I left my job blah blah blah and take the pains to do this and do that” as if they’re the only one who did it. You left the job for yourself, you started blogging for your own interests and therefore you did it for yourself. Yeah, you do post stuff that benefit people but you’re obviously you can something from it. And please don’t behave you’re in white sheets yourselves. I’ve read most of the tech blogger’s entry. Some written it in a way to obviously please to Samsung. Some written it to bash ipad2. Some “reviewed” it but basically its product shots and system configurations. If you look at eachother’s “reviews”- no benchmarks. no explanations. Filled with basic specs written in an essay format, jibberish conclusion and pictures taken from random sources. Don’t deny it. Don’t quit your day job. Not saying it out of disrespect or something, but seriously- do not quit your day job. @Sorcerer Again wanted to ask you same question, v bothered about time not about the winning and losing. And who the hell are you to question us? Do you belong to Indiblogger Sources? Why do you support the negative end? I don’t understand the damn attitude of your’s? Just don’t make the relationship break over here. I’m not your enemy or you are not my enemy. I just respect one’s feelings as I expect from others as well. I’ve lost for some deserving winners than, I’d never tried to complain, but I don’t like to say I lost, I was just ridiculously ruled-out like other bloggers. Yea, I don’t mean to say, I don’t want to do day job, but it was my passion and what your meaning to guide me to take day job? And please stop supporting Indiblogger. They are irresponsible, which made us to show our Furious attitude! Thanks for your comment, and please don’t make this tread even popular. I’ll be writing a post soon and will share link with you. Hope you understand from there and once again I’m just opposing the misleading elements of the contest. I’m neither criticizing Indiblogger not winners! The hell with it. I can’t make horse out of donkeys. Stop over-reacting. Don’t send me any links and spam all over the internets. To winners of this contest; why do you have to justify your win? You won because judges thought you should win; simple! To losers of this contest; guys, if you’re participating in a contest with a motive of winning, be prepared for losing it also. LEARN TO LOSE LIKE A MAN, guys. I see whoever tries to calm you down, you ask them to shut up because he is a winner or has got some benefit from IndiBlogger team (? )(BTW who tipped-off about it to you). The contest was sponsored by Samnsung and you’d also agree that they’ll not give away 20 tabs for free; nothing in this world comes for free. They’ll select only those entries which are relevant to them. Did you guy assumed that no-one else but only you’re deserving contestant? How can you judge your own post? Every mother thinks that her child is THE BEST in the world. I also don’t understand why you did not send a mail to the IndiBlogger team for clarification rather than posting it on the public forum? What did you want to achieve? Next thing which I didn’t understand that you wanted an immediate answer (for which the best way was to drop a mail). Do you really think that these IndiBlogger guys keep a continuous tab on all the threads which are posted on the forum? Is it practically possible? Next, when a reply was posted you straight-away rejected it because it clarified everything. But, again you insisted that it does not clarify anything (really???) because it does not announce you or anyone whom you want as a winner; common guys grow up! Why should someone compare any of the posts with those whom you think should have been winner, you’re not judges of this contest. You even forget the fact that you’re able to continuously write against the owner of the forum on his own website and you are allowed so. You know it very well that any other community would have thrown you out by this time. Even then you doubt their genuineness? I’m sure even if they apologise or revise the winner list (why should they do that) as per your DEMAND (as if you’re workers of his factory and he’ll not be able to move forward without you), you’ll not stop. You’ll start saying that finally they have bowed down because they were wrong! What ever has happened, has happened. It’s past now and there is no point shouting about that anyway. Please do take some responsibility in choosing winners from the next contest you run. Make sure you stick to your rules, end the contest in time and announce the winners in time. Many people (including me) don’t want to see any blame game, its really childish. Finally I just want to pass this Message to Renie Ravin. Bro, I used to be great admirer of Indiblogger and I was the active member of it since past 2 year. I really liked your ranking system and all. Regarding Indiblogger Samsung Galaxy Tab contest : Do you sincerely think that all the winners of the contest are deserving? If not, don’t you think Samsung India Guys listen to you, if you objected the List. If not, you should have cancelled the entire deal and must have explained bloggers regarding their arrogant behavior. You haven’t did anything right and it shows your irresponsibility. We are unhappy not because that we lost Galaxy Tab, but we are unhappy about the fact that we lost to undeserving people. Its like India will be happy if they lose to Australia, but not if they lose to scotland. If the samsung people reached you, you will have every right to involve and let them know about the care you take for these contests that which certainly increase your reputation. You might have recognized me, I’m the fool who called you that my site was migrated to another host and please consider my entry in the MsWord format. I was damn serious and confident about my entry despite of fact that I’ve personally used galaxy tab 10.1. You should have understood the feelings of the bloggers and react to their words, but none of your team has done that which reflects the fact that you guys are least bothered about the feelings of the bloggers and I just wanted to ask you one simple thing, unless you care about the bloggers or blogger, why the heck you have launched the Bloggers Community? As I’ve accepted that fact that I’m fool and I’ve wasted over 7 working days of my valuable blogging life, to participate and promote my entry of this Damn Funny Contest. Why do you guys think it in negative manner, just please understand to our personal feelings. Hope you are least bothered about it and you might have turned into a Corporate Politician who cares about Money and not the Ethics. I used to respect the Indiblogger community a lot, but you guys lost it because of your irresponsibility and think skinned mentality. I’m vexed of you and your sick strategies. I’m no more going to be active Indiblogger member and I don’t deserve to be the member of Indiblogger which is completely as sick as Indian Govt. Though you’ve read all the posts regarding your irresponsibility, you just tried to escape from the situation. But you have to take the responsibility and I’ll try to provide huge publicity for you don’t worry. Do what ever you want with your so called Trivial Bloggers and I’d like to say you lost your reputation and you are never going to get it back unless you respect one’s work. I dont hesitate to say more of the professional bloggers are going to leave your community soon and also people who supported you here are going to leave you as well. I believe your community is going to be a pale community without spirits and sporty minds of youth. Agreed with one fact Siddharth, that although Indiblogger claims they didn’t choose the winners, they still know that a few non deserving entries won, but then they didn’t care about the bloggers and thought just about business and money, not the bloggers. A thoughtful comment, and yes, I would one of the those who would always ask people to take care before trying out any contests in future, hosted by Indiblogger. Renie, 70 comments and nothing called as an explanation from your side. Especially to the comments made by Me and Siddartha, I expected your reply there. This shows how well the system runs here, and so predict the future of Indiblogger from now. Soon there would be a few who would always support Indiblogger because they got something through this site, but there would be many folds the count of those supporters, who would actually oppose everything knowing the fact about this site. I won’t blame Samsung here, because if I were hosting a contest in my website, I would have the right to choose the winners, or else at least ask for the justification about the winners chosen by the Samsung. You guys knew what was going on, but still the greed of earning through the contest made you forget the importance you need to give to the bloggers. This would hit you back soon! Wow! What an attitude. The guy who even doesn’t share his name, doesn’t even care how to reply to someone who is talking out of frustration, shouldn’t deserve to comment at all. And talking about the contest entries, you are saying what all the bloggers wrote in the entries, right? Then where did the damn rules go? the level of interaction? where was that in the winning entries? And keep your baseless points to yourself. We are not reviewing an iPhone to have discussions about the good or bad, this is about a contest where we gave our part and know how much we worked on it. Oh and yeah, I checked your blog.. before calling others with weird names, keep in mind that you don’t deserve to be a part of that community called bloggers. Your blog posts have a paragraph of your content, copied PR article and a picture.. you call yourself a blogger and a part of Indiblogger.. haha! Just because you are one of those guys paid by Indiblogger (or someone who get incentives), doesn’t mean you lose your mind and talk whatever comes.. When a contest runs with the rules, why do those damn rules don’t come into the scene when the winners are announced? And you, INDIBLOGGER is responsible for this. TAKING MONEY for contests and leaving the entire thing to Samsung does show what kind of greed runs in all those who are a part of Indiblogger. Oh please my name is very well in public you’re just don’t know where to find it. I am find n00bs can find it but you guys can’t?? Must be something in the air, eh? Just so that you know, this is the exact way I speak to people face to face. Because I know what I am saying that I don’t need to use cheesy oneliners to get my facts. You can try the personal insults, but when/if you do so you’re pretty much going to prove my point. Changing the rules in the middle? Wrong! Truth be told there wasn’t any effective way for them to know who has or has not showed the video so that rule is wasted. But at the end of the day they (Samsung or Indiblogger- irrelevant) have chosen the winners. They didn’t say 20 of them are winners and otheres others are loosers, they simply liked it and hence chose it. Honestly, some of the lines on those winning entries did lol me but that’s about it. Maybe the samsung suits didn’t like the content, or found too much cliche, it was too boring- and maybe the decision was taken based on what they glanced. That possibility exists. But claiming that they have chosen them and hence automatically deeming the rest of the 200 entries as “undeserving” is your imagination. Its extremely clear, its only those “tech” bloggers who are venting their frustration. For the love of sanity, don’t participate any contests- move on. Blog your frustration out. Using the word scam, calling samsung/indiblogger as frauds, calling neutral guys as “supporters”, trolling in groups, calling people names, etc. That’s way more baseless. The winners got the tablets and the access. Move on, will you?? You didn’t win. Some of you guys (obviously you guys know eachother) badmouth by bashing the winners and doing “extensive analysis” of a blog post. You all knew that this is a marketing strategy but you were getting something out of it- hence you participated, knowing that there is an opportunity that might not win. And you didn’t win. See if you are so desperate to get media samples then all you need to do is contact their PR. Its not that difficult. Showing your credibility is, especially if you do not have any. Oh thank you for not deeming as a blogger. Bunch of you need to learn manners first :P.
Your highness, for you everything is a PR. First learn how to do benchmarks, learn about synthetic and real time benchmarks, learn how to do stress testing and then come infront of me and say whatever you want. You don’t have the resources to keep your real readers informed, it shows where you stand. Thanks to indiblogger for organizing such a nice contests. hmm This time the luck was not with me. waiting for next contest. Previous story We are 4. We blog, therefore we are!